So, for those who don’t know, can you give me a brief rundown of the brand? 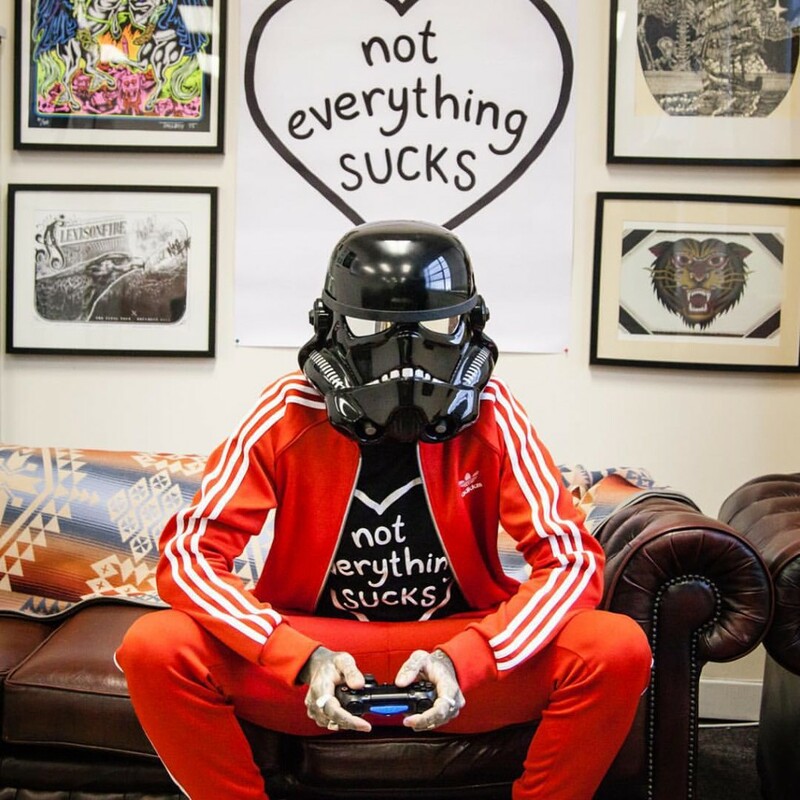 So Abandon Ship… We call ourselves an alternative lifestyle brand from Scotland but that doesn’t really say much… we make clothing that we love for people we love. 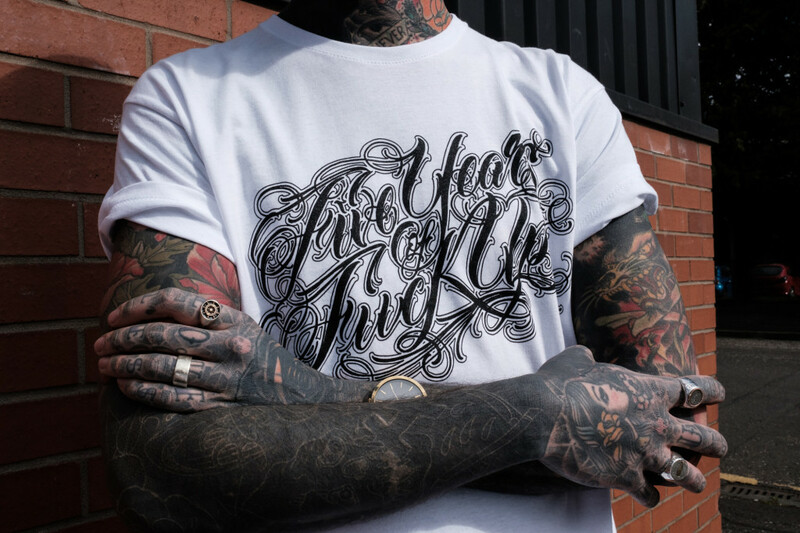 We take a lot of references from traditional tattoo artwork but work with a lot of amazing designers and artists so our range is usually pretty eclectic. Beyond that we believe in being transparent with our customers and spreading a positive message. BTC: Brighton is quite the trek from your motherland, why did you decide to make the trip? Brighton has been one of my favourite conventions for years, even before the brand existed I used to travel down to check it out with my wife. I love the vibe of the show and the city its held in. Brighton has a great culture and vibe to it and that is apparent at the convention too. As I said, I want to take the brand to a lot more conventions going forward so it made sense that our first one back would be my favourite. BTC: What are you most looking forward to about the weekend? Seeing old friends and meeting new ones. I know a lot of people attending so it will be a great time! Plus a convention is always a good excuse to pick up some new prints for the house. BTC: You are heavily tattooed yourself… Can you highlight some of your favourite tattoos and tell us a bit about the artists you chose and why/story behind? Tattooing has been a part of my whole adult life. From when I started getting them at the age of 17 I always wanted to be fully covered. At the moment the main project I am working on is adding a lot of black work to my shoulders and neck. I have had my arms blacked out for about 7 years now so it has been a natural progression and I love it. Some of my favourite tattoos I have are by Iain Sellar. He is one half of “Long Fox” who work with Abandon Ship a lot and is an amazing artist so when he started tattooing it was inevitable that I would get tattooed by him. 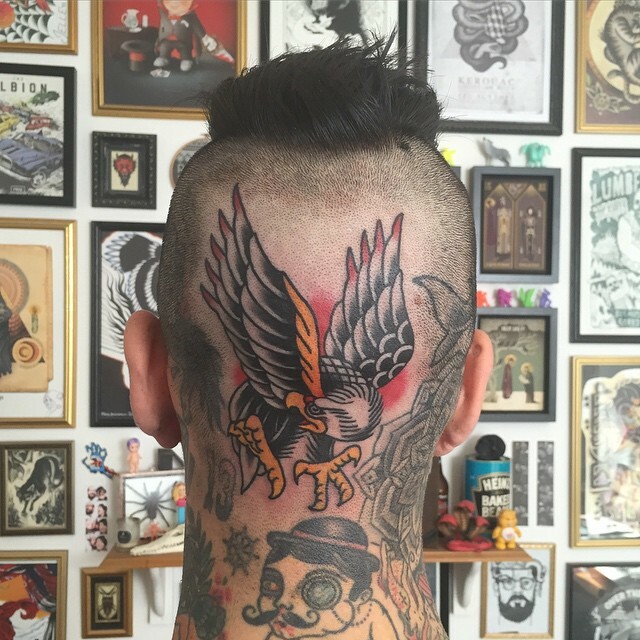 He has tattooed my head twice (a shark on the side and an eagle on the back) and I love them both. Another artist who has done a lot of work on me is Craig Ridley. He has tattooed my arms, hands, palms, legs… pretty much everywhere and I trust him a lot. Cal Jenx is also working on my back at the moment and that has been an incredibly sore but fulfilling project. I held off on my back for a long time but I am glad it is him that is working on it – he is doing an amazing job. BTC: Are there any artists you are excited to check out during the convention? To be honest I am always excited to see new artists that I haven’t heard of before. It is the most enjoyable part of the show for me. With Instagram I see most of my favourite artists work in real time so its always fun to find someone new whose artwork blows your mind. BTC: Planning on getting any work yourself over the weekend? Nah, I never really get work at conventions because I am usually working or I leave it until the last minute. I always, ALWAYS get tattoo envy at the shows though, a friend will roll up to the stall with a sweet new tattoo and I will get jealous and want to be tattooed but wont have the time. I counter this usually by getting tattooed just before the show or just after so I have something to look forward to. BTC: What can BTC punters expect to find from you at the convention? We will be bringing some older designs that are hard to find along with some of our latest products – a little bit of something for everyone. BTC: You’ve achieved a lot so far with AS, what have been some of your highlights? Ah there has been so many! I think the main highlight is that I get to do this for a living and working with so many awesome people. It is a privilege to get to do this and one I embrace! BTC: You’ve talked openly about the changing retail environment, and how brands need to adapt or die. 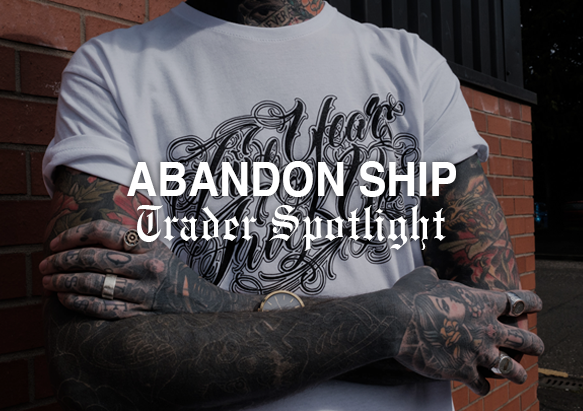 What’s next for Abandon Ship? For us the most important thing is to keep knocking out awesome designs, to have fun at events like Brighton Tattoo Convention and provide for our families! 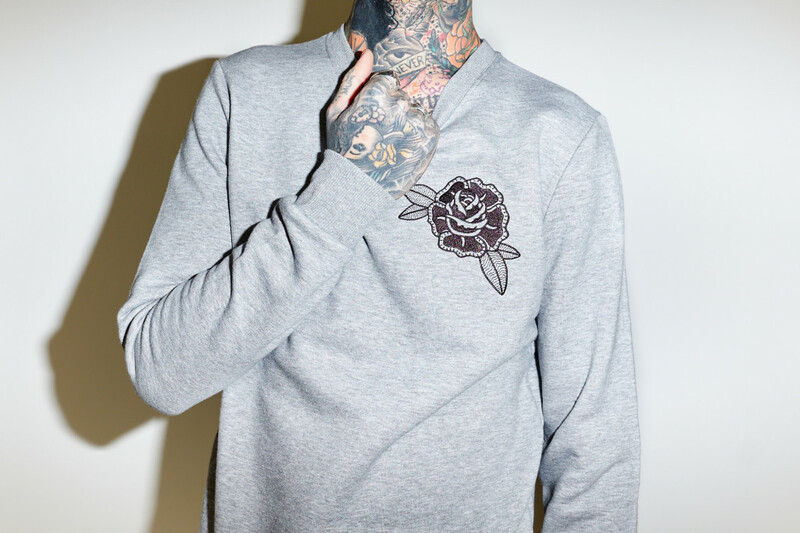 Check out Abandon Ship Apparel here, and stop by their booth at the Convention in April. Still haven’t got your ticket? Grab one quick here.